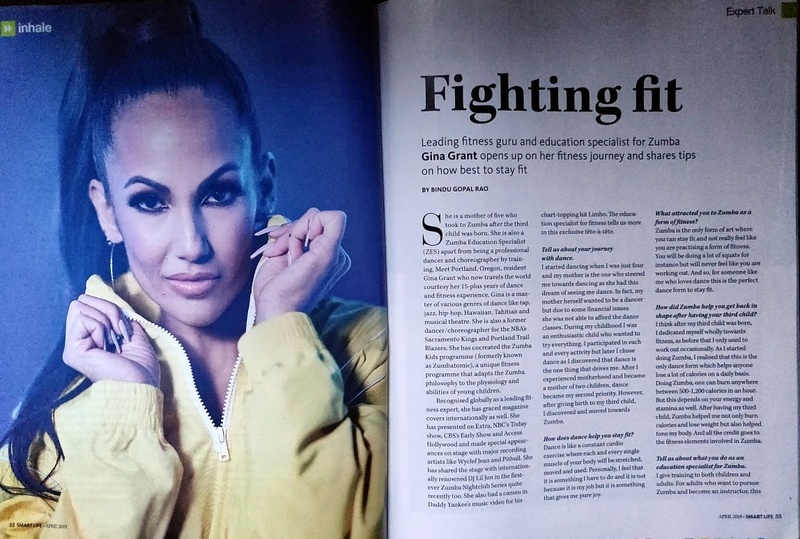 Gina Grant is a leading fitness guru and education specialist for Zumba, the worlds’ largest branded dance-fitness company. She is a mother of four who took to Zumba after the third child was born. She is also a Zumba Education Specialist (ZES) apart from being a professional dancer and choreographer by training. Meet Portland, Ore. Resident Gina Grant who now travels the world courtesy her 15 plus years of dance and fitness experience. Gina is a master of various genres of dance like tap, jazz, hip-hop, Hawaiian, Tahitian and musical theatre and she was also a former dancer/choreographer for the NBA’s Sacramento Kings and Portland Trail Blazers. She has co-created the Zumba Kids programme (formerly known as Zumbatomic), a unique fitness programme that adapts the Zumba philosophy to the physiology and abilities of young children. Recognized globally as a leading fitness expert she has graced magazine covers internationally as well. She has presented on ‘Extra’, NBC’s ‘Today’ show, CBS’ ‘Early Show’ and ‘Access Hollywood’. She has made special appearances on stage with major recording artists like Wyclef Jean and Pitbull. She has shared the stage with internationally renowned DJ Lil Jon in the first-ever Zumba Nightclub Series quite recently too. She also made a cameo in Daddy Yankee’s music video for his chart-topping hit ‘Limbo’. The education specialist for fitness tells us more in this exclusive tête-à-tête. Tell us something about your journey with dance? I started my dancing when I was just four years old and my mother is the one who steered me into dancing as she had this dream of seeing me dancing. In fact my mother herself wanted to be a dancer but due to some financial issues she was not able to afford the dance classes. During my childhood I was an enthusiastic child who wanted to try everything and as such I participated in each and every activity but later I chose dance as I discovered that dance is the one thing that drives me. After I experienced motherhood and became a mother of two children dance became my second priority. However, after giving birth to my third child, I discovered and moved towards Zumba dance form. How does dance help you stay fit? Dance is like a constant cardio exercise where each and every single muscle of your body will be stretched, moved and used. Personally I feel that it is something I have to do and it is not because it is my job but it is something that gives me pure joy. What attracted you to Zumba as a form of fitness? Zumba is the only form of art where you can stay fit and not really feel you are practicing a form of fitness. You will be doing a lot of squats for instance but will never feel like you are working out. And so for someone like me who loves dance this is the perfect dance form to stay fit. Tell us something about your journey to fitness. How did Zumba help you get back in shape after having your third child? I think after my third child was born, I dedicated myself wholly towards fitness as before that I only used to occasionally workout. As I started doing Zumba I realized that this is the only dance form which helps anyone lose a lot of calories on a daily basis. Doing Zumba one can burn anywhere between 500-1200 calories in an hour session but this also depends on your energy and stamina as well. After having my third child, Zumba helped me not only burn calories and lose weight but also helped my body to be toned and in a good shape. And all the credit goes to the fitness elements involved while doing Zumba. Tell us about what you do as an education specialist for Zumba. I give training to both children and adults. For adults who want to pursue Zumba and become an instructor, this course allows them to get a license to start teaching others. Apart from this, I teach the basics of Zumba which includes six editions of rhythm to adults to help them maintain their fitness levels. What are some dos and don’ts when practicing Zumba? The first thing I always say is to pay attention to the shoes you wear while performing Zumba because you may end up with knees injuries if you are not wearing the right shoes. The other thing is that it is important that you listen to your body while also listening to your instructor during your session because if there is any move you are not comfortable doing, it is better that you do not try it. It is always better to give some time to ease into the moves and remember not to forcefully stretch your body. Tell us something about the Zumba DVDs you have been associated with. Firstly I would say I am fortunate enough that I could be a part of DVDs which are consumer centric as by using these DVDs people can learn Zumba at their own pace and at least get their hands on experiencing the basics of Zumba. Moreover, I have been the part of few Zumba video games also and in fact I have been part of more than 10 DVDs so I feel good to help people be fit. How does the Zumba app help? Can everyone use the app? We have an app called ZIN play (Zumba Instructor Network) which is available both in IOS and Android. This app is the network of Zumba instructors all around the world who can learn new things on a regular basis. This app includes the new styles in Zumba, fitness tips and many more thing which an instructor can share it which teaching their students. What is your advice to women who want to stay fit after child delivery? The one thing that I continued to do after I received my doctor’s clearance from delivering my children was Zumba. I found that the amount of calories burned in one Zumba class was more than I would burn in an hour on the treadmill and was way more fun. Not only would I burn calories, but because Zumba is a total body workout, my body toned up as well. Find an exercise program that you truly enjoy and stay consistent. Be patient and listen to your body. Do not rush to get back to your pre-baby weight. Enjoy the moments with your little one as your body heals. Remember to check with your doctor before starting any workout program. What are some precautions to take before starting Zumba? Make sure you have the proper attire and footwear for a Zumba class. Wear clothing that you are comfortable in. Be sure to wear sneakers that allow your feet to pivot easily. Drink lots of water before, during and after class. Be prepared to get fit and dance away your worries. What are some generic measures that women must take to stay fit? A healthy diet combined with consistent exercise is the best way to stay fit. As a working mother of five children, finding the time to do so is the most difficult. However I would tell all women that we must make time for ourselves to live healthy and happy so that we can be the best version of ourselves. I do not believe in having future plans as such and I just want to stay with my family and kids and be happy.